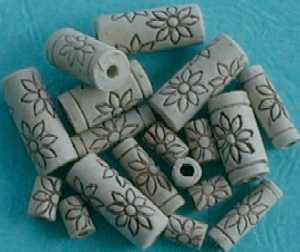 High-fired ceramics are exactly what the name indicates--they have been fired at higher temperatures for extra strength. In the time I have seen selling and using them, I have never seen a broken one--although I am sure it is possible. 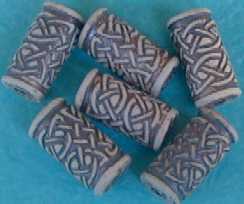 They all have beading holes of at least 4mm, which makes them even more versatile. 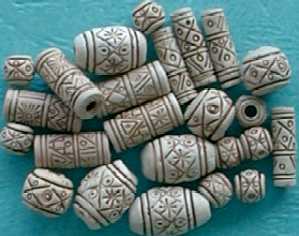 There is a small variation in size, and some have the design more strongly imprinted than others. Be sure to click on the pictures to see another view, and read the notes for each style. 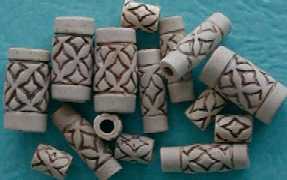 10x20mm; a very popular pattern. Large Egypt* Oval; 14x20mm; shape varies.